Strong management and leadership competencies have been identified as critical in enhancing health system performance. While the need for strong health system leadership has been raised, an important undertaking for health policy and systems researchers is to generate lessons about how to support leadership development (LD), particularly within the crisis-prone, resource poor contexts that are characteristic of Low- and Middle-Income health systems. As part of the broader DIALHS (District Innovation and Action Learning for Health Systems Development) collaboration, this paper, published in a supplement from Health Policy and Planning, reflects on 5 years of action learning and engagement around leadership and LD within primary healthcare (PHC) services. 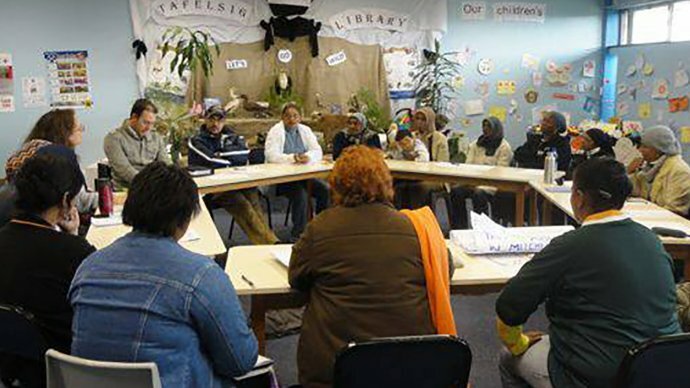 Working in one sub-district in Cape Town, researchers co-created LD processes with managers from nine PHC facilities and with the six members of the sub-district management team. This article provides insights into how leadership is currently practiced and highlights lessons about whether and how this approach to LD enabled a strengthening of leadership within this setting. Findings suggest that the sub-district is located within a hierarchical governance context, with performance monitored through the use of multiple accountability mechanisms including standard operating procedures, facility audits and target setting processes. This context presents an important constraint to the development of a more distributed, relational leadership. While the data suggests that gains in leadership were emerging, the authors experiences are of a system struggling to shift from a hierarchical to a more relational understanding of how to enable improvements in performance, and to implement these changes in practice.